« Column: How Big Is Big (10) Enough? Related to that countywide effort, the initial board for an unincorporated transit authority – a precursor to an eventual formal authority – could be seated by Oct. 20, the date of the AATA board’s next meeting. It would include representatives from Ann Arbor, Ypsilanti, and other districts throughout the county. In terms of increased service, the work plan includes a focus on: establishing the AATA as a vanpool service provider; establishing service to the Detroit Metro Airport; improving work-transportation connections between Ann Arbor and Ypsilanti; and continuing work on commuter rail. Related to Detroit Metro service, Ford told the board that work on getting airport service in place had continued and that in the last three weeks he’d worked with Wayne County Economic Development Growth Engine (EDGE) on the issue. He said follow-up work was being done on the definition of public transportation as it relates to airport service. [Detroit Metro Airport charges access fees to private transportation operators.] Ford said the AATA would try to select a private-public partnership soon – in November. Before the DDA board was a resolution that would offer a $14,417 challenge grant to fund service improvements for the Ann Arbor Transportation Authority Route #4 bus, which runs between Ypsilanti and Ann Arbor. The dollar figure for the grant is based on a total estimated price tag for the improvements of $180,000 and a Washtenaw Area Transportation Study (WATS) computer model, which estimates about 8% of riders on the #4 bus have destinations west of State Street in the DDA district. Thursday, Oct. 6, 5-7 p.m. at Glencoe Hills Apartments clubhouse, 2201 Glencoe Hills Drive, Pittsfield Township. Tuesday, Oct. 11, 9-11 a.m. at University Hospital, 1500 East Medical Center Drive, Ann Arbor. Classroom #2C108, across from the gift shop and cashier’s office. Tuesday, Oct. 11, 1-3 p.m. at Michigan Union, 530 S. State St., Wolverine Room AB, Ann Arbor. Wednesday, Oct. 12, 9:30-11:30 a.m. at Dom Bakeries, 1305 Washtenaw Ave., Ypsilanti. Tuesday, Oct. 18, 5-7 p.m. at Ann Arbor District Library, 343 S. Fifth Ave., Ann Arbor. More information about the proposed changes is available online, along with details about how to give input. As part of his report from the planning and development committee, Rich Robben reviewed next year’s work plan, calling it “very aggressive.” He described how it includes development of countywide networks and improvements to current service. Service improvements highlighted by Robben included: adding service between Ann Arbor and the Detroit Metro airport; adding vanpool services; improving service between Ann Arbor and Ypsilanti; upgrading the AATA website; expanding the bus storage facility at the South Industrial headquarters; expanding night ride service to Ypsilanti; and reconstruction of the Blake Transit Center. During deliberations, Anya Dale characterized the work plan as challenging, but said she thought the AATA can accomplish it. Roger Kerson gave credit to AATA staff for being able to accomplish the goals in this year’s work plan. Board chair Jessie Bernstein called it an active, committed, dedicated past year on the part of the AATA, saying that there’s another active plan for next year. Outcome: The board voted unanimously to approve its FY 2012 work plan. The board considered a resolution to approve its operating budget for the 2012 fiscal year, which runs from Oct. 1 through Sept. 30. The budget calls for expenses of $30,410,616 against only $29,418,995 in revenues, for a deficit in the coming year of $991,621. That shortfall will be made up by drawing on the fund balance. According to the budget resolution, the AATA’s fund balance policy requires it to maintain reserves equal to at least three months’ worth of operating expenses. And the AATA expects to have $1.2 million more in its fund reserve to start the year than the minimum fund balance policy requires. Reporting out from the planning and development committee earlier in the meeting, Rich Robben ticked through the figures from the 2012 operating budget. He said the budget will maintain and improve service, and will support the work plan and the transit master plan (TMP). He acknowledged the roughly $1 million deficit, and described it as stemming from some one-time costs with development of the TMP, such as an improvement program for each district of the county, plus the governance structure. The deficit would be funded from unrestricted net assets, he explained. Even though unrestricted assets will be used, the AATA will still have 3.1 months of operating expenses in reserve after those assets are used in the course of the year, he said. By board policy, the AATA must maintain a reserve of at least 3 months of operating reserves. Robben led off deliberations by saying it’s not a sustainable budget. But he said it would catapult the AATA towards a transition to countywide service. It’s aggressive, he said, but not taken lightly that the AATA would operate at a deficit. It’s also not AATA’s responsibility to build bank accounts, he said, so it’s appropriate to use the funds for this type of purpose. 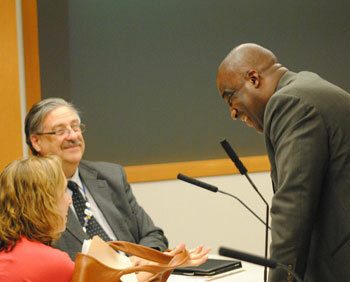 CEO Michael Ford (right) talks with AATA board members Rich Robben and Anya Dale after the Sept. 15 meeting. Anya Dale noted that many of the expenses that are causing the deficit are one-time costs. Now is the time, she said. Roger Kerson said the budget reveals AATA’s next challenges. Planning was for this past year, he said, and next year is the financing challenge. It’s the right thing to do, he said, and he was looking forward to feedback from the financial review group that will be making funding option recommendations. Board chair Jesse Bernstein said he was seriously concerned that the deficit year be a one-time commitment. He picked up on Kerson’s mention of the financial group, and noted that McKinley CEO Albert Berriz and former Washtenaw County administrator Bob Guenzel were co-chairing that group. It’s composed of people who understand financing and the politics of funding public activities, he said. Bernstein called the AATA’s efforts at a transition to countywide service not an empty transition, but a real transition. The budget deficit, he said, should be recognized as unusual and unique, for one year only. 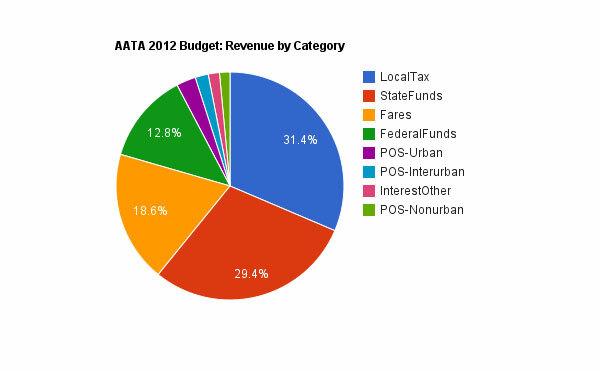 Outcome: The board unanimously approved AATA’s fiscal 2012 budget. On the agenda was a resolution that expressed general support for continuing to work with surrounding communities on the Washtenaw and Livingston Line (WALLY) project. WALLY would provide commuter rail service on a 26-mile route between Ann Arbor and Howell. Relevant entities identified in the resolution include the state of Michigan, Livingston County, the city of Howell and the Ann Arbor Railroad. However, the one “resolved” clause requires that funds allocated for WALLY in the 2012 budget – $50,000 – cannot be spent, except with the explicit consent of the AATA board. At the Sept. 15 meeting, the board received a status report on the WALLY project from Michael Benham, a special assistant for strategic planning at AATA. Benham was hired in 2009 to handle the WALLY project. Since then, he’s become responsible for directing the development of the countywide transit master plan (TMP), which the AATA has developed over the last year. Highlights from Benham’s report included the fact that starting in 2008, AATA has spent a total of $102,853 on the WALLY project, while other partners have spent a total of $225,000. That money has been spent primarily on a study and public education efforts. 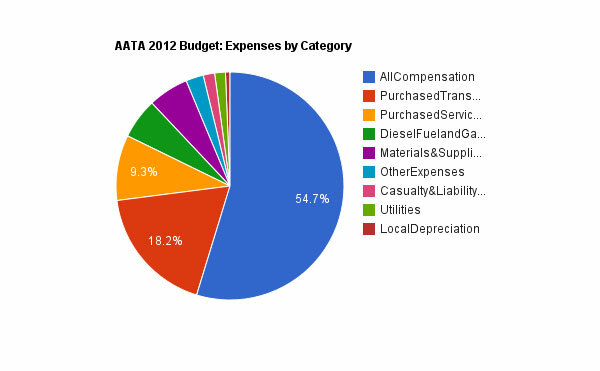 As part of the AATA FY 2012 budget, the AATA has included another $50,000 for the project. That money would be put towards station design. Benham pointed board members to an appendix in the report with comparative data on WALLY. He characterized WALLY as “right in the ballpark” with other similar projects – at the low end of the range for capital costs. For similar commuter rail connections already in place, he said, the average time from idea to actual service was 10.5 years. So if people ask why WALLY is taking so long, it’s not actually taking so long, he concluded. Rich Robben said he wanted to make the observation that the board had some concerns about the viability of the WALLY project. That’s why the presentation had been requested from Michael Benham – to make a reassessment of financial issues and to look at the prospects of closing remaining gaps in funding. Roger Kerson also noted that board member David Nacht (who did not attend the board meeting) had raised some concerns at a committee meeting. Kerson characterized WALLY as a challenging project, but said, “We’re up to the challenge.” Kerson said the AATA was changing the eco-system by making transit a priority. Traffic is real, and congestion is real, he said. Having an alternative to US-23 will be welcome. He said he was glad to be going ahead in a measured way. Board chair Jesse Bernstein said he couldn’t imagine a clearer statement of moving forward in a careful way. Outcome: The board voted unanimously to approve the resolution requiring board approval for any expenditures associated with WALLY. The board considered a resolution authorizing a one-year contract with Plante & Moran for auditing services. A policy adopted by the AATA board on June 16, 2011 limits contracting with any one auditing firm to a total of eight years. That meant that the auditing firm the AATA had previously used, Rehmann Robson, was not eligible to provide auditing services. The request for proposals (RFP) was sent to 19 public accounting firms. Plante & Moran’s proposal was judged to be the best of the three proposals received by the AATA. Roger Kerson reported from the performance monitoring and external relations committee that the AATA had received three bids from the 19 solicitations they’d sent out. The AATA evaluation team had ranked Plante & Moran as the best of the three bids, and the committee supported that recommendation. When the board deliberated on the issue, AATA controller Phil Webb described how the RFP was sent to 19 CPA firms. The 19 were picked from a list of firms in southeast Michigan that did similar work. Technical abilities were 60% of the evaluation score, he said. The cost part of the bids were opened later and counted for 40% of the evaluation. The evaluators were Webb, board treasurer Sue McCormick, CEO Michael Ford. Outcome: The board voted unanimously to approve selection of Plante & Moran as the AATA auditor. A resolution on the agenda called for authorizing a contract with VPSI Inc. for vanpool services that is not to exceed $6,600 per year for each AATA owned/managed van. Vanpools are arrangements in which a vehicle is provided through the service, but is driven by one of the members of the pool. Riders pay for operational costs. Currently, the MichiVan program, operated by VPSI, provides such a service in the Ann Arbor area. However, through fiscal year 2012 MichiVan will only continue to provide vanpool service for existing vanpools in the Ann Arbor area. It’s AATA’s intention to provide service for any additional vanpools that people might wish to create. Reporting out from the planning and development committee, Rich Robben described how in a vanpool, the monthly cost is paid by riders. The capital cost will be paid by a federal grant. Chris White, AATA manager of service development, told the board that AATA had been working on the project for a while now. [It was one of the service initiatives discussed at an Aug. 10, 2010 board retreat.] MichiVan will continue to operate (with about 100 vanpools) but there’s no ability to expand that number of vanpools. So AATA is looking to be a provider for expansion pools. It allows AATA a chance to get some experience before taking on a larger volume. The eventual goal, White said, is to assume operation of all of the vanpools in the county. This is an opportunity to do that gradually, he said. Outcome: The board voted unanimously to authorize a contract with VSPI Inc. for vanpool service. The board handled a number of housekeeping items. The board elects new officers every year. This year, board chair Jesse Bernstein said at the Sept. 15 meeting that the current officers have agreed to continue. As the organization contemplates a transition to a countywide focus, it was felt that it would be good to have some continuity, he said. AATA board officers are: Jesse Bernstein (chair); Charles Griffith (secretary); and Sue McCormick (treasurer). The committee chairs are: Rich Robben (planning and development committee), and Charles Griffith (performance monitoring and external relations). Outcome: The board voted unanimously to maintain the same slate of board officers. Also on the agenda was the approval of the full board’s meeting schedule, as well as the schedule for its committee meetings. Board meetings fall on the third Thursday of the month. [.pdf of board and committee meeting dates] AATA board meeting information packets are generally available before the meetings on the AATA website. During deliberations, Anya Dale asked if there was an opportunity to talk about holding meetings earlier in the day. CEO Michael Ford told Dale that there had not been a discussion about that, and he said that staff can be open to changes or modifications. Board chair Jesse Bernstein said he’d be very open to discussing times, once dates are firmed up. Outcome: The board voted unanimously to approve its meeting schedule. Reporting out from the AATA’s local advisory council (LAC), a co-chair of that group, Jody Slowins, reported that terms were coming to an end, and that members would need to be reappointed. The LAC is a body that provides advocacy for seniors and disabled people. Gloria Kolb had submitted an application, Slowins said, and the LAC welcomed her graciously. Slowins said she’d been involved with the LAC for the last 12 years, and she’d never seen such a good group. The AATA’s paratransit coordinator, Brian Clouse, is strongly supportive of the LAC, she said. Recommended for appointment to the LAC were: Gloria Kolb, Cheryl Weber, Clark Charnetski, Mary Wells, John Kuchinski, Lena Ricks, Eleanor Chang, and Stephen McNutt. Outcome: The board unanimously approved the appointments to the LAC. At the board’s August 2011 meeting, Ford had announced that McKinley Inc. CEO Albert Berriz and Bob Guenzel, retired Washtenaw County administrator, will be co-chairing a panel of financial and funding experts. They are tasked with reviewing a report on funding options and making recommendations that will form the basis of a governance proposal for countywide transit. The funding report to be reviewed and analyzed by the group is the third volume of the transit master plan (TMP). [.pdf of Part 1 of Vol. 3 Transit Master Plan Funding Options] [.pdf of Part 2 of Vol. 3 Transit Master Plan Funding Options]. CEO Michael Ford’s written report to the AATA board for its Sept. 15 meeting included a partial list of members in the group tapped to review the funding options report for the countywide transit master plan. At the meeting, an updated list was circulated. Besides Berriz and Guenzel, members of the group include the following: Patrick Doyle (CEO, Domino’s Pizza); Ric DeVore (regional president, PNC Financial Services Group Inc.); Mary Jo Callan (director, office of community development, Washtenaw County); Mark Perry (director of real estate services, Masco Corp.); Andy LaBarre (vice president of government affairs, A2YChamber); Tim Marshall (president and CEO, Bank of Ann Arbor); Norm Herbert (retired treasurer, University of Michigan); Adiele Nwankwo (senior vice president, PB Americas Inc.); Mike Cicchella (financial planner, Cicchella and Associates, and former Northfield Township supervisor); Leigh Greden (executive director of governmental and community relations, Eastern Michigan University); Conan Smith (executive director, Suburbs Alliance and chair, Washtenaw County board of commissioners); Jonathan Levine (professor, University of Michigan college of architecture and urban planning); Jason Lindauer (wealth management advisor, Merrill Lynch, and mayor of Chelsea); Mark Ouimet (state representative, District 52); John Thorhauer (president and CEO, United Methodist Retirement Communities); Jon Newpol (executive vice president, Thomson Reuters); Dennis Schornack (special advisor on transportation, Governor’s Office); Jim Kosteva, (director of government relations, University of Michigan); Paul Dimond (attorney, Miller Canfield). The first meeting of the group was Friday, Sept. 16 – the day after the AATA board met. Most of the members were able to attend. The group received a presentation of some of the material they’d already been given in written form. They also asked for specific additional information and analysis, including: the specific economic impact of transit investments in communities of comparable size to Ann Arbor; and a measure of the costs that could be avoided through increased investment in transit. 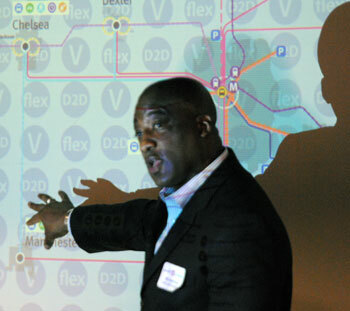 While the amount and timing of a possible countywide transit millage received scant mention, a robust theme of the initial conversation was the potential for creative private-public partnerships in funding improved transit. Berriz called his and Guenzel’s selection as co-chairs of the group symbolic of the potential for private-public partnerships. Berriz told members of the group at the Sept. 16 meeting that they will meet three more times, and will produce a white paper by the end of the year. In his public commentary at the AATA board’s meeting the day before, on Sept. 15, Larry Krieg, with Wake Up, Washtenaw!, congratulated the AATA for the people it had assembled for the financial review. It’s an impressive list, he said. He asked that “out-of-the-box thinking” be tried. Krieg hoped that among the funding mechanisms the group could identify would be original, significant public-private participation. At its Sept. 15 meeting, the AATA board entertained various communications, including its usual reports from the performance monitoring and external relations committee, the planning and development committee, as well as from CEO Michael Ford. The board also heard commentary from the public. Here are some highlights. During his report to board members, CEO Michael Ford gave a brief update on progress with future governance issues connected with the entity that would eventually administer countywide transportation. 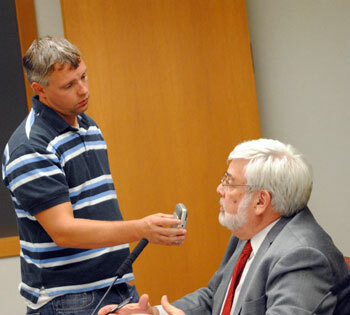 WEMU's Andrew Cluley interviews AATA board chair Jesse Bernstein after the Sept. 15 meeting. By way of background, the basic approach the AATA is taking to expanding countywide transit is to transition to an authority formed under Act 196 of 1986. The AATA has been working towards encouraging townships in the county to strike inter-governmental agreements [under Act 7 of 1967] to have joint representation to the board of any Act 196 organization. It’s conceived as a 15-member board, with seven seats from Ann Arbor, two seats from the southeast sector (Ypsilanti Township and Augusta Township), and one seat each for the city of Ypsilanti, Pittsfield Township, and multi-jurisdictional districts in the northeast, north middle, west and south middle parts of the county. As a precursor to the Act 196 authority, the AATA hopes to seat an unincorporated authority (U196) by Oct. 20, the date of the board’s next meeting. Ford reported at the Sept. 15 board meeting that he’d met with AATA board chair Jesse Bernstein and Ann Arbor mayor John Hieftje about an inter-local agreement between Ann Arbor, Ypsilanti, Washtenaw County and the AATA. Roger Kerson reported out from the performance monitoring and external relations committee that the Chelsea Express – a commuter service between Ann Arbor and Chelsea – is now near capacity. The AATA is now at the point of deciding what to do if the route meets capacity. Mary Stasiak, AATA director of community relations, said that one concern the staff is focusing on is to make sure the AATA “owns” everything that’s being developed for the site, given that some of it is being custom developed. The AATA has sent the initial designs back to the contractor for revision, because “we want to make it the best that we can,” she said. Thomas Partridge introduced himself as an Ann Arbor and Washtenaw County Democrat, an advocate for seniors and the disabled, and those needing and deserving of public services during this trying time in American history. He called for the election of a new chair of the board of the AATA to champion service that is friendly and caring in safe and ride-worthy vehicles. He questioned whether that’s been the case under current board leadership. SelectRide should not receive the bid for the AATA’s A-Ride paratransit service, Partridge said. He called the vehicles that SelectRide puts on the road “jalopies” that have accumulated more than 200,000 miles before they are purchased by SelectRide. Partridge also spoke at the second public commentary slot at the end of the meeting. He called himself an advocate for those who can’t attend the meeting. He said he had led the effort to get the board to meet in an accessible place. [Last year, the AATA moved its meetings to the boardroom of the Ann Arbor District Library from its headquarters on South Industrial Highway.] Despite those efforts, Partridge said, the board went ahead with their vote on the budget with three of its seven members absent. The budget items should have been deferred until the entire board could attend, he said. He complained that AATA staff members got people to come to board meetings to salute their incompetence. The public is being cheated by publicly funding vehicles that should never be on the road, he said. SelectRide, the company that holds the para-transit contract with AATA, perpetuates discrimination against everyone, Partridge said, even their own employees. His complaints have been whitewashed, Partridge contended, and he called on the board to elect new leadership. Carolyn Grawi spoke on behalf of the Ann Arbor Center for Independent Living. She said she came to support the new local advisory council appointments. She also congratulated AATA for its work associated with the non-motorized Washtenaw Avenue walkway and the accessible crosswalk – AATA was among the many players on that project, she said. She also congratulated Mary Stasiak’s department for receiving an APTA AdWheel award, recognizing its billboard ads. The Chronicle could not survive without regular voluntary subscriptions to support our coverage of public bodies like the Ann Arbor Transportation Authority board. Click this link for details: Subscribe to The Chronicle. And if you’re already supporting us, please encourage your friends, neighbors and colleagues to help support The Chronicle, too! Do we have information on where the u196 board will meet and what its public accessibility will be?